Indy Downtown Doggie services include dog boarding, daycare, training, bathing and more. Our professional and friendly staff has the knowledge and understanding of your dogs needs. This allows you to meet in a group with other owners and their pets one night a week for one hour. A group setting will allow you and your dog to practice in an environment with distractions. Is there something specific you would like to work on? Do you prefer a non-class environment? Then one-on-one training is best for you. We will work with you and your dog in a private session. Some problems are easiest to fix in the dog’s own everyday environment. For example, getting into the trash, chewing, biting, etc. Or if you have a new puppy at home and want to get started on the right foot? Let us come to you. Your pet will spend half the day learning obedience and manners, and the other half be spent playing in daycare with the other dogs. (Pre-requsite: Obedience 101 class, Lodge and Train, or Private Lesson). Let us do the work for you. Leave your pet anywhere from one to four weeks. They can learn basic to advanced obedience, tricks, and behavior modification. Dog agility is the most popular dog sport in the United States. It’s a timed event where dogs run, jump, climb, and weave through a variety of obstacles in a set order. A great way for you and your dog to work together as a team. 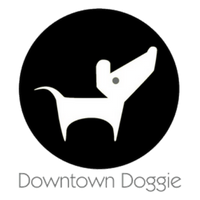 Indy Downtown Doggie (DTD) services include: dog boarding, daycare, training, and more. Do you feel bad leaving your dog at home all day while you are gone? Are you worried about what you might come home to? Is there not enough time to give proper attention to your pet? Then doggie daycare is for you! Your dog will experience indoor/outdoor free play, water play, plenty of socialization, and will be walked at least 4 times per day keeping your dog happy and active. 10 day pass $250. Second dog half off $125. Expires after 6 months. 20 day pass $480. Second dog half off $240. Expires after 6 months. When your dog stays at Downtown Doggie, your dog will enjoy all the amenities of their very own doggie hotel! They will sleep on their own dog cot in an indoor private 10×5 room. Your dog will be walked at least 4 times per day and be able to play in our 3000 sq foot indoor/ outdoor daycare area with the other dogs. We are conveniently located in the heart of Indianapolis just around the corner from all major hotels. Only $15 per additional dog per night, when sharing same room. An additional charge of $30 for daycare will be applied for any pet picked up after 12pm the following day. Want to keep your dog looking and feeling their best? Bathing services include loose hair removal, brushing, nail trimming, and ear cleaning. Prices may vary depending on temperament and coat condition. Are you having a busy week and don’t have the time to take your doggie for a walk? Let our dog walkers come to you. Our trained dog walkers will come to your home and take your dog for a 15 minute walk! We will come to your home, and pick up or drop off your dog if you don’t have time during your busy schedule. Visit the FAQ page to access and download Indy DTD applications, forms and documents.